A Scottish Pig Academy to encourage stockmanship training in the Scottish pig industry has received an initial cohort of 10 Scottish Pig Academy trainees. Funding for the course development has been provided by ASDA, QMS, the European Union and Skills Development Scotland. 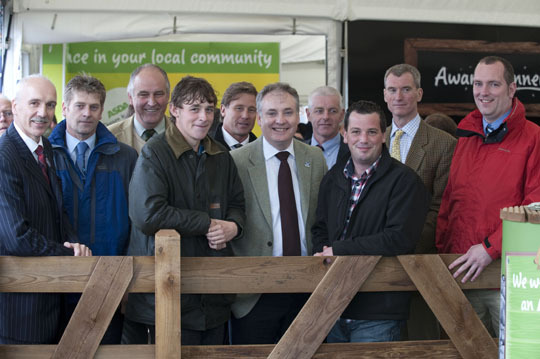 Pictured from left at the Scottish Pig Academy Launch are: Uel Morton (QMS) , Alan Turnbull (Barony College), David Soutar (Strathmore Farming Company), Bruce Arnott (stockman at Strathmore and Scottish Pig Academy apprentice), Craig Mackie (stockman at Slaines Park and apprentice) Rural Affairs Cabinet Cabinet Secretary, Richard Lochhead, Jim Viggers (Vion), Sandy Howie (Scottish Pig Producers), Dr Chris Brown, Asda and Ryan Nobles (Slaines Park). The inspiration for the new Scottish Pig Academy came from pig producers, unit managers and staff taking part in the Pig Business Network run by Quality Meat Scotland. “Farmers and staff attending these meetings voiced concern about the lack of a structured training programme for the industry, which erodes skill levels in existing staff and make it more difficult to recruit new people into the industry,” said Uel Morton, Chief Executive of Quality Meat Scotland. “The objective of the Scottish Pig Academy is to implement a recognised vocational training programme for basic and advanced pig stockmanship in Scotland. Crucially the programme can be delivered locally and at low cost to farmers,” Mr Morton added. There are currently around 500 people employed on Scottish pig farms and the aim is for the new Academy to train farm staff to develop the technical knowledge and skills required to maximise productivity and efficiency on pig farms. Training will be delivered online on the farms where the apprentices work, making it easy to access from any location and to work in a flexible way to fit round work schedules. A network of experienced mentors will provide support to individual learners working through the modules. An initial group of 10 trainees are expected to take part in the programme with around two-thirds expected to be located on farms in the north-east and the remainder widely dispersed around the rest of Scotland. Rural Affairs Secretary Richard Lochhead said: “Scotland’s livestock farmers are in a class of their own when it comes to producing top quality red meats – and our farm assured pork producers are no exception. To deliver a high quality product it’s important that the pig farming sector is supported by the right training and skills development opportunities. “Therefore I’m delighted that the Scottish Pig Academy will shortly begin to train the first group of apprenticeships, who will receive practical on-farm training in all aspects of pig stockmanship. Amongst the first tranche of apprentices to sign up are Bruce Arnott and Craig Mackie. Bruce is employed by Strathmore Farming Company which runs a 620 sow outdoor unit in Angus over seven sites and Craig is employed by J Forbes & Partners at Slains Park, a 2000 sow outdoor unit near Stonehaven in Kincardineshire. Dr Chris Brown, Asda’s Head of Ethical and Sustainable Sourcing, said: “We’ve been working hard to support the Scottish pig industry over the past few years and this initiative is another great example of collaboration in the supply chain.